Word definitions often differ from industry to industry. This is especially true of global trade. Where such fundamental phrases as "delivery" can have a far different meaning in the business than in the rest of the world. For business terminology to be effective, phrases must mean the same thing throughout the industry. That is why the International Chamber of Commerce created "INCOTERMS" in 1936. INCOTERMS are designed to create a bridge between different members of the industry by acting as a uniform language they can use. Each INCOTERM refers to a type of agreement for the purchase and shipping of goods internationally. There are 11 different terms, each of which helps users deal with different situations involving the movement of goods. For example, the term FCA is often used with shipments involving Ro/Ro or container transport. INCOTERMS also deal with the documentation required for global trade, specifying which parties are responsible for which documents. Determining the paperwork required to move a shipment is an important job, since requirements vary so much between countries. Two items, however, are standard: the commercial invoice and the packing list. INCOTERMS were created primarily for people inside the world of global trade. Outsiders frequently find them difficult to understand. Seemingly common words such as "responsibility" and "delivery" have different meanings in global trade than they do in other situations. In global trade, "delivery" refers to the seller fulfilling the obligation of the terms of sale or to completing a contractual obligation. "Delivery" can occur while the merchandise is on a vessel on the high seas and the parties involved are thousands of miles from the goods. In the end, however, the terms wind up boiling down to a few basic specifics: Costs: who is responsible for the expenses involved in a shipment at a given point in the shipment's journey? Control: who owns the goods at a given point in the journey? Liability: who is responsible for paying damage to goods at a given point in a shipment's transit? INCOTERMS can thus have a direct financial impact on a company's business. What is important is not the acronyms, but the business results. Often companies like to be in control of their freight. That being the case, sellers of goods might choose to sell CIF, which gives them a good grasp of shipments moving out of their country, and buyers may prefer to purchase FOB, which gives them a tighter hold on goods moving into their country. In this glossary, we'll tell you what terms such as CIF and FOB mean and their impact on the trade process. In addition, since we realize that most international buyers and sellers do not handle goods themselves, but work through customs brokers and freight forwarders, we'll discuss how both fit into the terms under discussion. 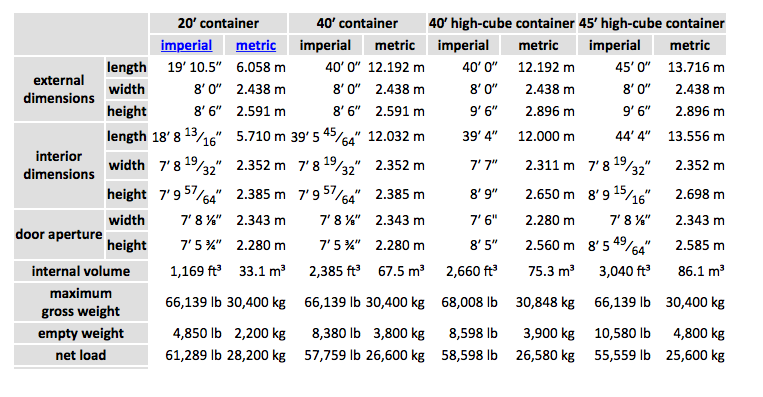 Weights and dimensions of some common types of containers are given below. Values vary slightly from manufacturer to manufacturer.